Renowned minimalist ultra runner, Rob Krar, doesn’t like to wear anything around his waist. 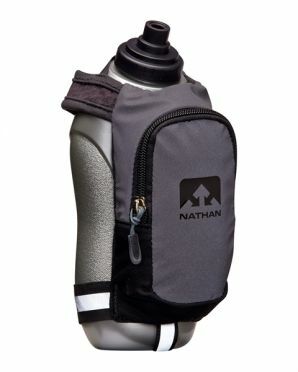 So he helped us develop the Nathan VaporKrar Waist Pak 600ml that even he loves to wear. Comfort and high-performance merge with this super lightweight, form-fitting waist pak that features our new 18oz soft flask. 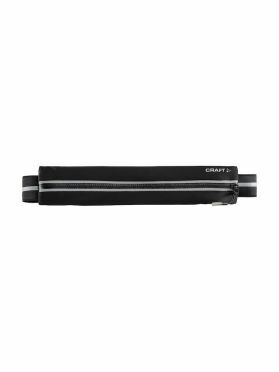 The Craft Media belt waist bag black is a waterproof media belt with flexible pouch that fits all kinds of cellphones. Comes with zippered pocket and reflective details for extra visibility. Adjustable for a tight fit. 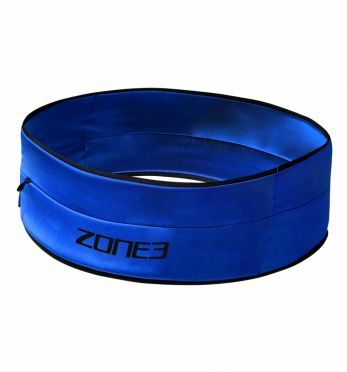 The Zone3 Flip belt waist bag blue is a tubular pocket with no buckles or elastic cords. It is easy to put on and take off and is designed to store all your essentials in one easy and comfortable way. This is the perfect accessory for running or cycling training and is much more discrete and comfortable than wearing any armbands or using pockets which are too big or small. 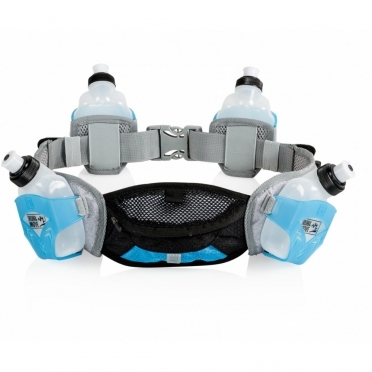 Very innovative and ergonomic running belt. Including 4 x 175 ml flasks, 2 holders are removable.Zipper pocket for utensils. 2 x 2 elastic loops for energy gels.Available in black/white and grey/black/blue. 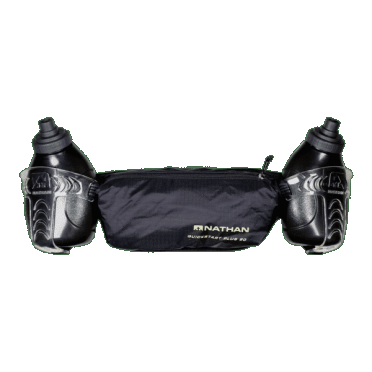 The Nathan QuickStart plus 40 hydration belt black is a convenient and highly practical hydration hip belt with pockets for all your essentials kit. 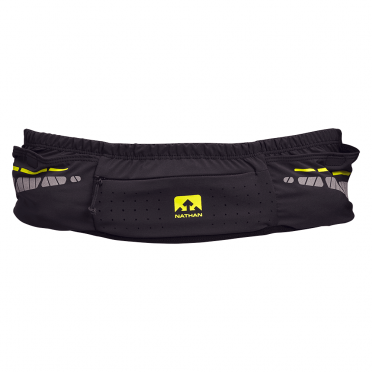 The hip belt comes with an ergonomic design that has a fully adjustable strap system that provides a bounce-free fit. 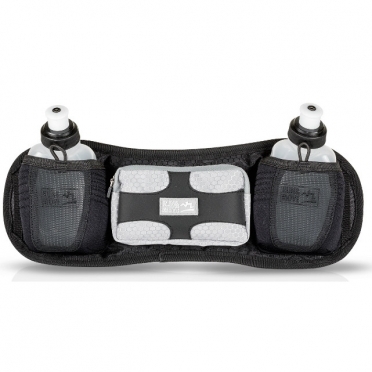 The belt also comes with two 330ml flasks which are housed in Speedlift holsters which allow you to quickly access your water while you’re on the go. Zipper pocket with additional compartment inside. Including 2 x 175 ml flasks. 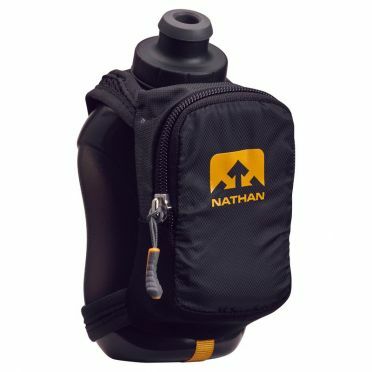 The Nathan SpeedDraw Plus hand bottle grey is a highly comfortable Flask which can easily attached to the hand and is fully adjustable due to the hand strap with thumbhole. The 535 ml SpeedDraw Flask with Race Cap offers quick bursts of fluid and the large, expandable zipped pocket carries phone, keys, ID and other running essentials. Reflective details increase visibility in low-light conditions. 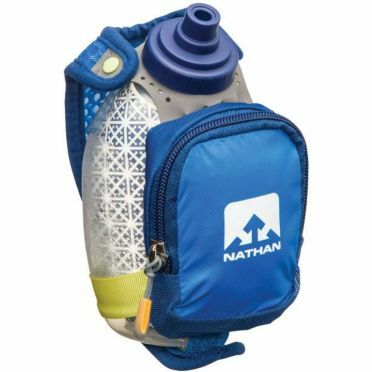 Fully adjustable handstrap and thumbhole make the Nathan Quickshot plus insulated hand bottle blue the most comfortable, grip-free running companion for short and intense runs. 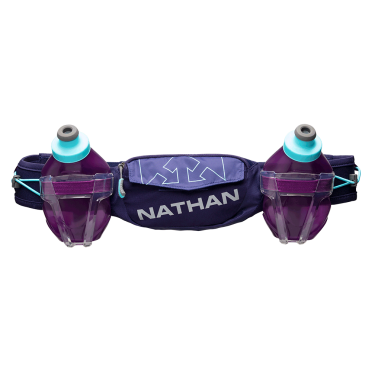 It incorporates a unique moisture-wicking hand strap with soft perimeter binding, which eliminates the need to grip the flask and feels great against the skin. It comes with a 235ml reflective flask with the Race Cap, originally designed for gel consumption, so fluids come in quick bursts to avoid interrupting breathing or affecting stripe. Additionally the one-way valve opens and closes automatically so no liquid get lost by leaking. On top of this, there is a small but expandable zippered pocket for keys, gels or other essentials you may need on your race. 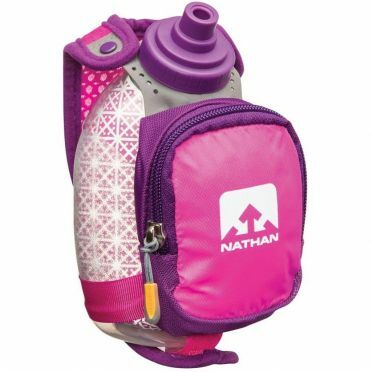 Fully adjustable handstrap and thumbhole make the Nathan Quickshot plus insulated hand bottle pink the most comfortable, grip-free running companion for short and intense runs. It incorporates a unique moisture-wicking hand strap with soft perimeter binding, which eliminates the need to grip the flask and feels great against the skin. It comes with a 235ml reflective flask with the Race Cap, originally designed for gel consumption, so fluids come in quick bursts to avoid interrupting breathing or affecting stripe. Additionally the one-way valve opens and closes automatically so no liquid get lost by leaking. On top of this, there is a small but expandable zippered pocket for keys, gels or other essentials you may need on your race. 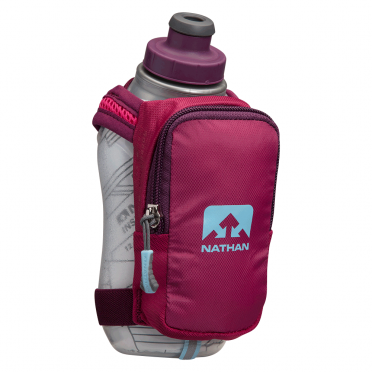 The Keep fluids colder, longer, with this Nathan SpeedShot plus insulated hand bottle pink, a perfect-sized 355 ml insulated handheld that feels great in your hand. Lightweight, grip-free, and reflective for added night-time visibility, this popular handheld is ideal for shorter to mid-distance runs. 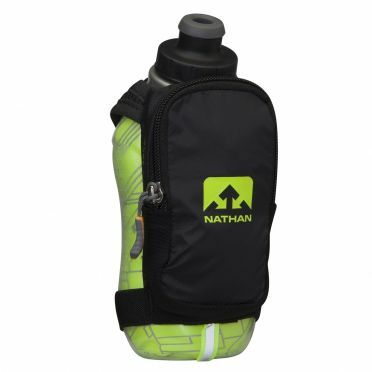 The Keep fluids colder, longer, with this Nathan SpeedShot plus insulated hand bottle green/black, a perfect-sized 355 ml insulated handheld that feels great in your hand. 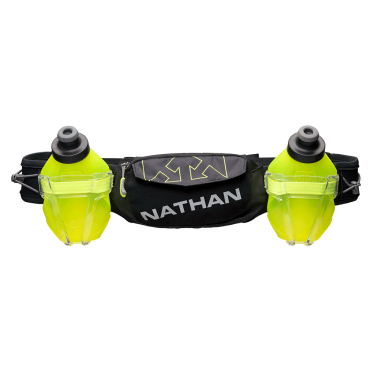 Lightweight, grip-free, and reflective for added night-time visibility, this popular handheld is ideal for shorter to mid-distance runs. 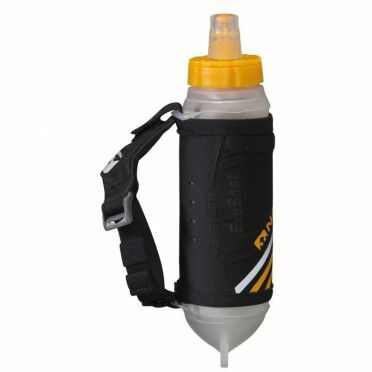 Take handheld hydration to the next level of comfort and efficiency with this Nathan Exoshot hand bottle black/orange, a grip-free, ergonomic soft flask. 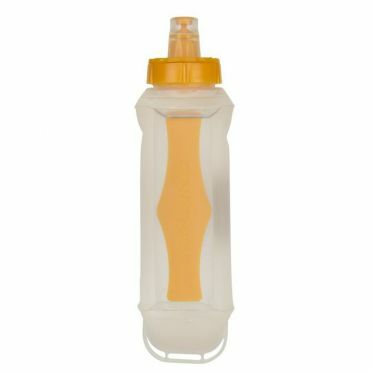 The patented ExoSpine means the soft flask feels natural in your hand, even as the fluid level decreases. 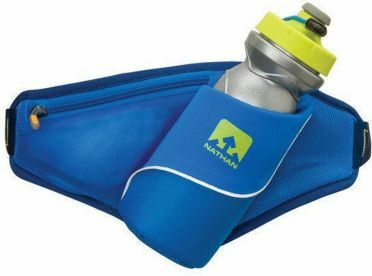 Works great with Nathan vests, as the durable spine allows you to easily store the soft flask in front pockets. It’s so comfortable, you’ll probably forget that you’re holding it.